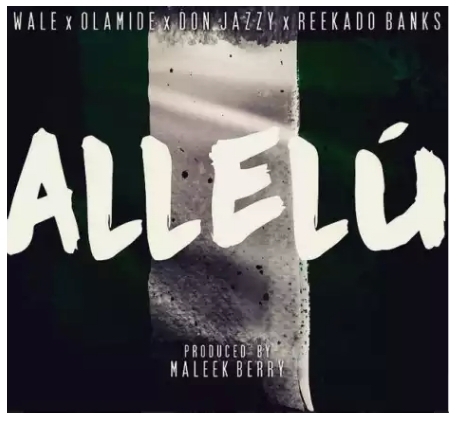 Yesterday Don Jazzy, Wale, Olamide and Reekado Banks blessed us with the first international collaboration for 2015 with Maybach Music artiste, Wale kickstarting the song. It’s too early to judge but early thoughts suggest the song won’t make our list of international collaborations that turned out hits despite featuring 2 industry heavyweights in Don Jazzy and Olamide. Allelu premiered on Toolz hosted show, Afternoon Drive on Beat FM. We have listened to the song at the minimum of 50 plays and we have learned certain things or rather, made deductions from the uptempo song. While we aren’t sure of some, we present to you 4 things we learned from the joint. 21 year old Mavin Records artiste, Reekado Banks laced the hook of Allelu. He did well on the Maleek Berry produced track but our findings and intellect show Leyi better known as Reekado Banks replaced Starboy chief Wizkid on the song. Wale’s verse on the song had leaked before in a studio session video & freestyle and the video showed he was going to be releasing the afrobeat vibe with Wizkid, which will make their collabos 3. But for unknown reasons Wizkid pulled out of the song and we won’t be surprised, at all, if Don Jazzy is the man that brought in his kid. Olamide also gave props to Wizkid on his verse which was off point as Wizzy wasn’t on the record. Washington DC rapper Wale real name, Olubowale Victor Akintimehin proved on Allelu that he knows his Ondo and Nigeria roots quite well but he’s been away for too long to connect properly. He delivered some lines that showed he is from here 100%. “Moyege, halleluyah moyege,” is a cut from a popular song that was a favorite in Nigerian churches in the 1990s, Wale used this line on the song. He also gave props to Ondo & his mother. “Baba Folarin, omo olowo, London tonight and it’s Lagos tomorrow, DC is home, Ondo my mama…,” he rapped. “Call me Akata, too may tattoos,” another line where he proved he is connected. Akata is a term for a Nigerian that has lost his/her way to American culture. He also had some egusi, with gucci on the plate, apparently. YBNL chief Olamide rapped mostly on Allelu in English a move that we can’t call a failure, he was decent but his craft is better when he drops heavy street lines in his local dialect, Yoruba. Olamide probably decided to throw lines in English because he wants to better Wale on Allelu. Don Jazzy has featured on the last two albums released by a top Nigerian artiste (Street OT & Double Trouble), which is very weird judging by his history. Don Dorobucci rose to fame (musically) dropping classic hooks on D’Banj’s (Mo’Hits) records and mesmerizing D’Banj’s ad-libs when Koko master wants to perform but these days he is everywhere and even featured on Iyanya’s last video, Gift. We can’t recall any classic or very good verse Don Jazzy has dropped but he is iconic when he drops hooks or introduces a song like he recently did on Dorobucci and Looku Looku. That is his strength, hooks or chorus like Nate Dogg (RIP). He has however dropped too many verses lately which needs to be reduced so his fans can thirst again. Don Jazzy lasted barely 16 seconds on Allelu another sign of his weakness at verses.